BOSTON, MA -- That's a wrap for the 2017-18 EHL Showcase Series, as the Eastern Hockey League Premier (EHLP) finished off the final featured event of the season this past Friday and Saturday. With every team in action, and a full slate of games, there were plenty of worthy candidates for this week's awards. 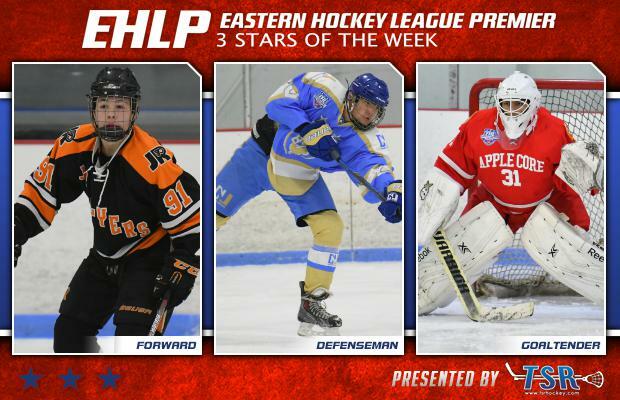 The EHLP is pleased to announce that Matt Wood (Philadelphia Jr. Flyers), Tim Lazouski (New Jersey 87s), and Justin Padilla (New York Applecore) have been named the TSR Hockey Stars of the Week. The week ahead includes 13 more games from Friday to Sunday. The next set of TSR Hockey Stars of the Week will be released on Monday, January 29th at 4:00pm. Catch the EHLP action all season long on HockeyTV. 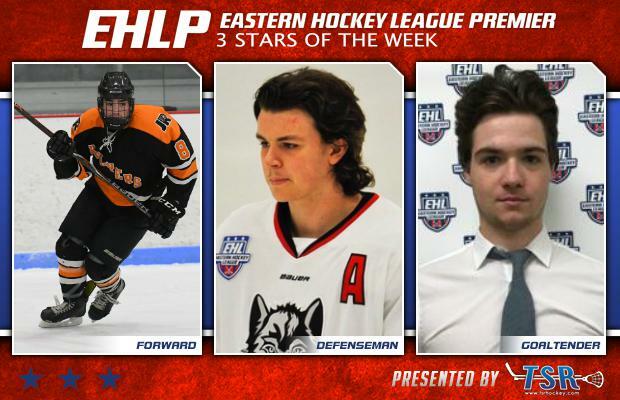 Another week has gone by and yet another Philadelphia Jr. Flyer forward has been named an EHLP Star of the Week. Wood and the Jr. Flyers went 2-1-0 over the weekend, and scored 22 goals over the 3 games. The 2000 forward, had at least a point in every game and recorded a hat-trick at the showcase in a matchup against the Philadelphia Revolution. The Pennsylvania native finished the week with 4 goals and 2 assists (6 points). Wood leads all players on the Jr. Flyers in scoring this season with 43 total points to his name. The Jr. Flyers will get back to work with a pair of games at home against the New York Applecore this upcoming weekend. Lazouski and the 87s won both their games at the showcase this past weekend. The 2000 defensemen recorded 3 assists over the 2 games for his squad, giving him a total of 12 assists on the year. The Belarus native has stepped up for the 87s during their 5-game winning streak, with 5 assists in the 5 victories. The 87s will look to continue their winning ways with matchups against the New Jersey Renegades and the Philadelphia Little Flyers this upcoming weekend. Padilla and the Applecore won both of their games this past weekend at the showcase, with the New York native between the pipes for both of the victories. On Saturday, Padilla stopped 33 shots in his team’s 2-1 win against the New England Wolves. The 2000 netminde, was solid the very next day in net as well, stopping 35 shots in the Applecore’s 6-2 win against the Philadelphia Little Flyers. Padilla now has 8 wins this season with a 3.27 GAA and a .923 save percentage. The Applecore will get back to work this week with a busy slate of games starting with the Philadelphia Revolution on Friday, followed by games with the Philadelphia Jr. Flyers the next two days. The EHLP would also like to recognize a trio of honorable mentions this week, starting with William Smith of the Philadelphia Jr. Flyers. The 2000 forward had a goal and 7 assists this past weekend, in his first 3 games with his new team. Nick Giaramita had himself a solid weekend for the Philadelphia Revolution, racking up a goal and 5 assists in his team's 3 games. Last, but not least, Garret Baldacci stood tall for the Central Penn Panthers, on his way to a 50-save shutout at the showcase against the New England Wolves.